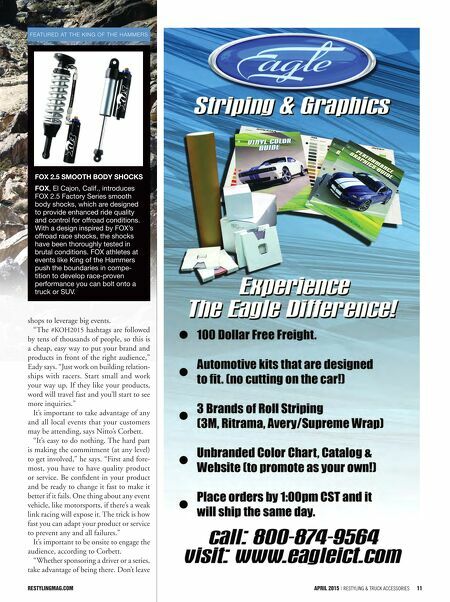 10 Restyling & tRuck AccessoRies | April 2015 restylingmag.com ence is the key, according to Bestop's Chick. "Most small shops are conflicted," he says. "They understand shows are going on, but then at the same time, they need somebody at the shop to keep the doors open and help the customers that come in. There's a way to do both. Anybody in the business today probably has a functional website. It doesn't have to be a killer web- site, but they should utilize it to acknowl- edge they know about the event, identify with the event, and in turn they receive valuable engagement with their intended audience. There is not much cost involved and a guy doesn't have to drive in the middle of the desert to do that." Promoters, like Ultra 4 Racing, can also provide web links leading to event infor- mation that can easily be embedded onto a shop's website. This is a great way to iden- tify with the event, with marketing created directly by the promoter that gives updates about the event. "A lot of enthusiasts can't just go take time off of work to go to the King of the Hammers race," Chick says, "so this is a way to offer something they will iden- tify with. This is an opportunity to get in front of those consumers and interact with them." 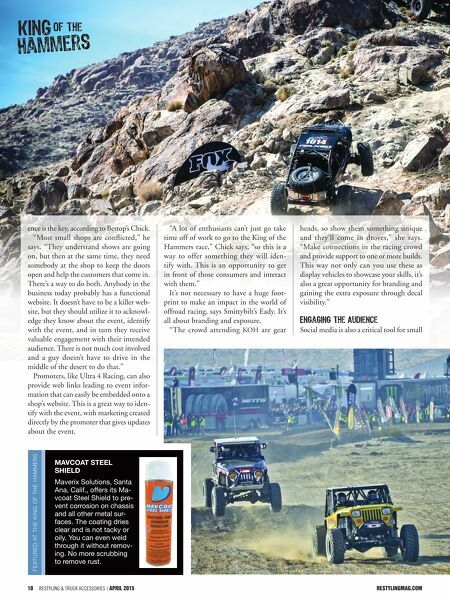 It's not necessary to have a huge foot- print to make an impact in the world of offroad racing, says Smittybilt's Eady. It's all about branding and exposure. "The crowd attending KOH are gear heads, so show them something unique and they'll come in droves," she says. "Make connections in the racing crowd and provide support to one or more builds. This way not only can you use these as display vehicles to showcase your skills, it's also a great opportunity for branding and gaining the extra exposure through decal visibility." Social media is also a critical tool for small Featured at the King oF the hammers MAVCOAT STEEL SHIELD Maverix Solutions, Santa Ana, Calif., offers its Ma- vcoat Steel Shield to pre- vent corrosion on chassis and all other metal sur- faces. The coating dries clear and is not tacky or oily. You can even weld through it without remov- ing. No more scrubbing to remove rust.